Looking for ways to spend a mental health day? How can you practice self-care on a day off? Life can get hectic and stressful very quickly. You might have a job that has a project deadline coming up and is requiring you to work extra hours at the office. Struggling to focus at work? If so, you’re going to need a mental health break from work. You may also be a working parent with multiple, never-ending demands and responsibilities in your life. You’re pushed to your limits and you know you need to take time for yourself, or you’ll burn out. If this is the case, you need time to just stop and take a timeout. It’s time to take mental health day, but what are you supposed to do? Is it time for self-care or just resting doing nothing? Regardless of what contributes to your stress, you will want to find ways to relax. 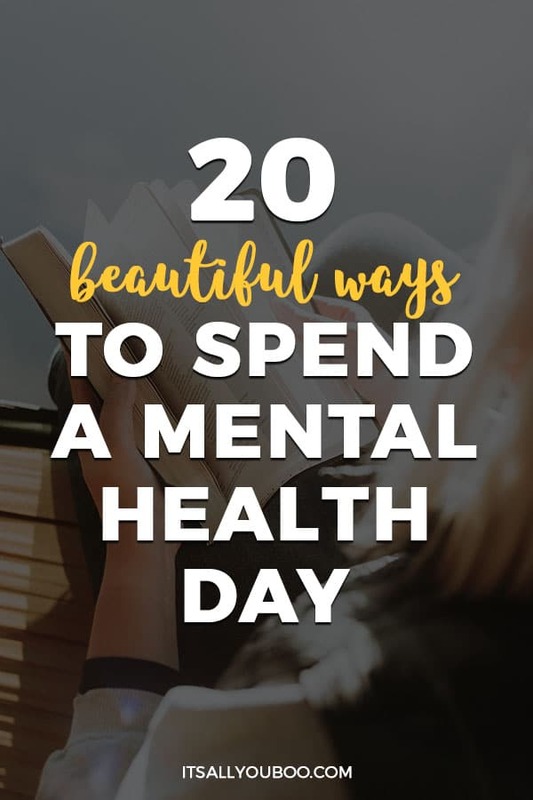 Read on to learn about 20 easy ways to spend a mental health day. Whether you’re a busy working mom or stressed out entrepreneur, you need to take a mental health day. It’s not just a time to rest, but a time to put your mental health first. That means removing yourself from whatever is stressing you out and giving you anxiety. We all can’t afford to take extravagant vacations every time we’re stressed out, or even afford to take a week off, which is why you need to make most of your mental health day. Turn off your phone, unplug from being on the clock and take some much needed alone time. 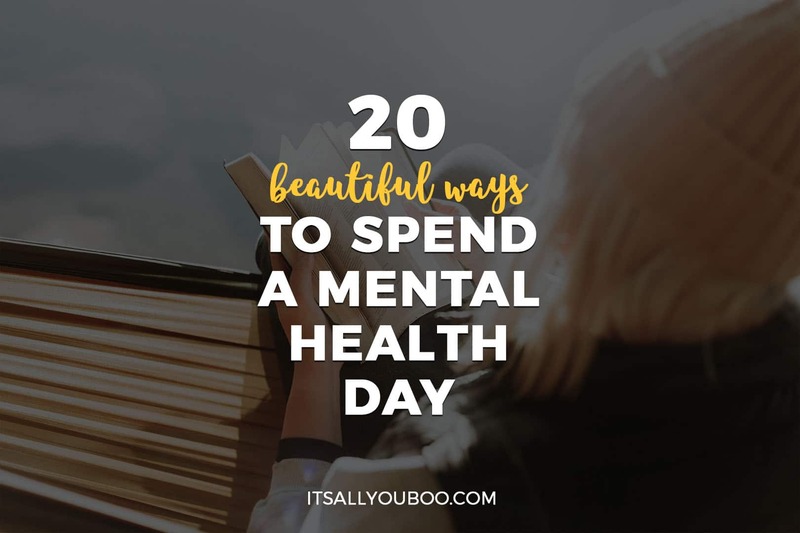 Here are 20 ways to spend a mental health day that leave you refreshed and recharged. Getting a message is one of my favorite ways to spend a mental health day. There are different types of massages you can receive for relaxation. In my experience, I’ve received Swedish and Thai massages for relaxation. If you’re sensitive to deep pressure, I would recommend doing a Swedish massage. If you love heavier pressure, I would recommend the Thai massage. Before you say you can’t afford it, head over to Groupon a few days before your mental health day and pick up a message for 50% or more off. When I first received acupuncture treatments, it was to help alleviate back pain. However, I eventually learned that acupuncture is used for many different conditions. Acupuncture can be a great way to relieve stress. At first, I was skeptical. How could inserting needles in my body possibly help relieve stress? I decided to give it a try, since it wouldn’t hurt. The worst that could happen is that it didn’t work. After doing weekly acupuncture for a month to help relieve stress, I felt my stress levels go down. Painting is one of the easiest ways to spend a mental health day. My former supervisor would take a week off every year to paint different things, while she was in nature. Every time she would come back to work from painting, I noticed that she seemed much relaxed and happier. No need to go buy supplies for yourself, simply search for a local Paint Lounge. They’re usually on Groupon too! I never knew about Epsom salt baths until a year ago. My massage therapist told me that my back muscles felt particularly tight that session. He recommended that I do Epsom salt baths on a weekly basis. Previously to knowing about Epsom salt baths, I would do bubble baths to help relax. Once I started doing Epsom salt baths, I stopped doing bubble baths because of how relaxing the Epsom salts made me feel. They also helped relieve a lot of the pain and tension in my back. Forget the bath bombs too, they might be pretty, but Epsom salt will make you feel amazing. Head to your local drug store or Walmart to pick up a tub for less than $20. Going on a nature walk has a ton of benefits. Nature walks take away a lot of the stressful distractions in everyday life, such as traffic and endless demands. Walking in nature gives you the opportunity to take your time, to be mindful and live in the present moment. It’s not a race. I love nature walks because I learn and observe something new each time. Life can feel like pressure to get things done and hurry all the time. Since everything goes by so fast, it’s hard to just stop and notice the most beautiful and simple things in life that are easy to miss. Meditation has long been known to help relieve stress. 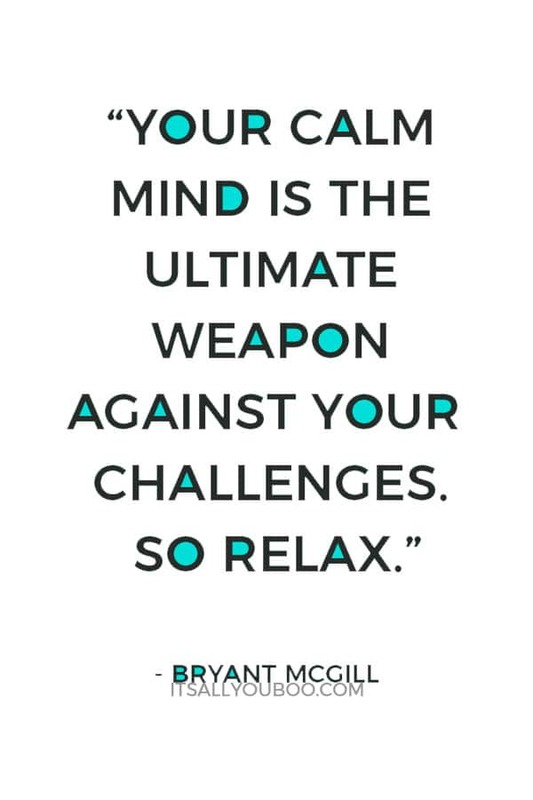 It’s one of my favorite stress management techniques, especially for stay-at-home moms or working moms. There are different ways you can learn about or do meditation. Meditation schools, fitness centers, and online programs all offer great meditation classes. In addition to classes, you can meditate anywhere and for as long as you want. Some people tell me they don’t have time to meditate in a class, so they take 5-10 minutes to meditate in the morning or at night. Other people I know meditate for hours at retreats. Playing or listening to music is a great stress reliever. You can play music on an instrument, listen to music, or go to a concert. I don’t recommend any specific music genre, because it really depends on your individual preference. It also helps you feel more energized when you’re tired. I know one person who listens to hard rock music in his car after a long day at work. He shouts the lyrics at the top of his lungs and he tells me that it feels great every single time. I know someone else who listens to classical music when feeling stressed because it instantly relaxes her. Sometimes you may just need to immerse yourself in fantasy land and read a good book. Books can be a great way to relax, remove distractions from your life, and relieve stress. I personally love to read mysteries to distract myself from my busy life. You can also try listening to audio books. If you’re busy working at your desk all day, take this time to rest your eyes and engage your listening. Click here to get two free audiobooks from audible. Spending time with a good friend can be an instant stress reliever. Be sure to choose a friend who can bring out laughter in the conversation or listen to you without judgment. You want to feel good afterward. If you spend this time with a friend who is negative, you might end up feeling more drained at the end of the day. You might not always have your friends or loved ones ready to hear you vent when you feel stressed or upset. During these times, writing in a journal can be a great way to express your feelings. You can choose to keep your writing in a journal or to throw it away after you write. When I used to do therapy, I had some clients who chose to burn their journal entries afterward because they felt it was therapeutic. I got this idea from one of my friends, who was struggling in trying to find something to help her relax. Her cousin gave her a sewing project for a birthday present and she found it surprisingly relaxing and soothing. I always thought that sewing was a huge, complicated project that would just add to my stress. However, there are different types of sewing projects, ranging in different skill levels. I tried pottery recently and found it extremely therapeutic and relaxing. It helped me remove distractions in my mind. I also loved how it felt on my hands. Doing pottery is one of many ways to spend a mental health day. You can also check your local recreation centers for pottery classes, as well as Groupon. When life gets stressful, sometimes you just need a good laugh. One of the best ways to spend a mental health day is to watch something that will make you laugh. Last month, I watched a stand-up comedy on Netflix and found myself laughing hard for a good portion of the show. You can feel stress slowly melt away the more you laugh. You can easily find a good comedy on cable, Netflix, or at an in-person show. When it’s hot outside, I love going to the swimming pool. The water is instantly relaxing and soothing. It also gives me the opportunity to burn calories and do something healthy at the same time. Visit your local recreation center or ask a friend who lives in a condo to use their pool. If you’re comfortable, lay on your back and spend time floating. The benefits of floating include reduced stress and anxiety, as well as increased creativity! Research has shown that having a pet can help reduce stress. Whenever my Golden Retriever lounges next to me, I instantly feel relaxed. If you don’t have a pet, but love animals, see if you can pet-sit for a neighbor, friend, or family member. It’s one of the best ways to spend a mental health day if you have been feeling stressed lately. There are so many ways to spend a mental health day at the beach. Going in the water, reading a book in the sand, playing volleyball, and making sandcastles are all wonderful ways to relax and de-stress. Even just people, cloud or bird watching really helps you to leave your troubles behind. One form of exercise to help you reduce stress is mixed martial arts. You learn various techniques such as punching, kicking, wrestling, grappling, and striking with knees or elbows. Everyone I know who takes a mixed martial art class feels great afterward. If Karate or Jujitsu sound a little too much for you, try something like Tai Chi. The benefits of Tai Chi are incredible, including reduced stress and anxiety. When was the last time you had an exotic meal at a restaurant? Sometimes it’s nice to break out of the monotony of going to the same restaurants all the time and trying something different. Several years ago, my friend took me to an Ethiopian restaurant and I loved the food. It was different, delicious, and a great way to de-stress from the usual hectic routine. Try something new, even at home, you can spend your mental health day preparing a healthy meal you found online. Do you love the water and live near it? If so, try going on a boat ride. It’s a wonderful way to just observe the beautiful surroundings and relax. I personally love to relax in or around water. If you live near water, during the warm months there are scenic boat tours you can go on. Does anything sound more relaxing than a sunset cruise around the bay? One of the easiest ways to spend a mental health day is to just do nothing. One of the reasons I get stressed is because of the multiple demands and responsibilities I have. Sometimes you just need to take a day off from your crazy schedule to do nothing! 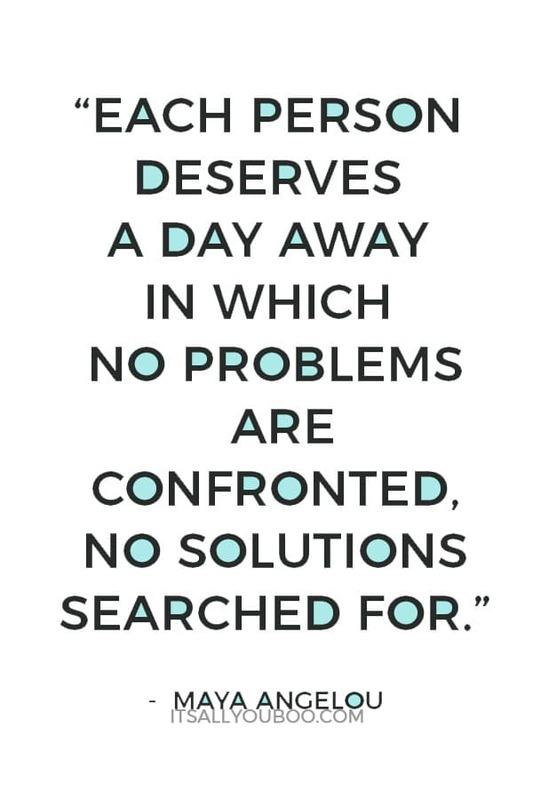 Like batteries, we need time to recharge and find ways to spend a mental health day. Every individual has different needs and desires when it comes to finding out what relaxes them. Some will like quieter activities and other people need to have more action to relieve stress. Regardless, consider taking a day off soon to participate in activities for emotional health. Ready to take a mental health day, but not sure what to do? 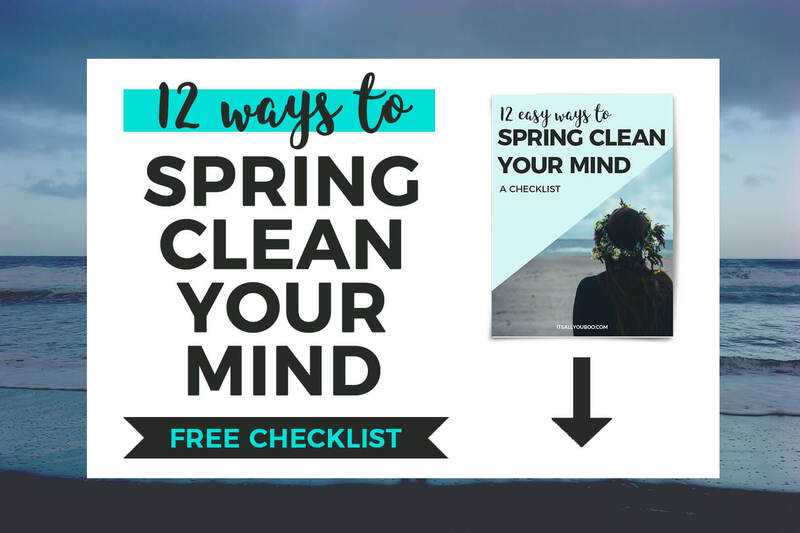 Get the Spring Clean Your Mind Checklist, with 12 strategies for decluttering your mind and taking a break from all the stress of your daily life. Don’t let anxiety and stress run unchecked in your life. 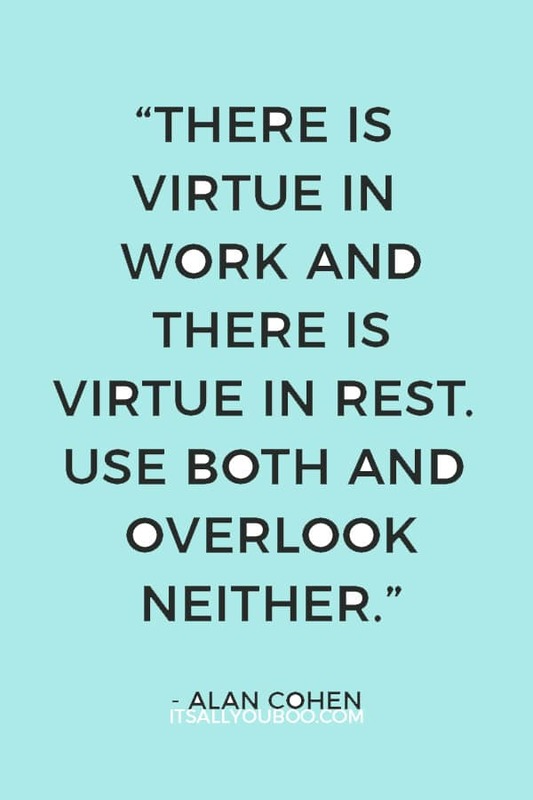 You work hard, you deserve time to rest. How will you spend your next mental health day? Joyce Felix can be found on her blog at Celebrate Moms Forever. 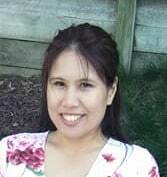 Joyce is a mom blogger that writes about parenting, motherhood, pregnancy, stress management, and other mom-related topics. I love all these ideas. Mental health days are among my favorite. 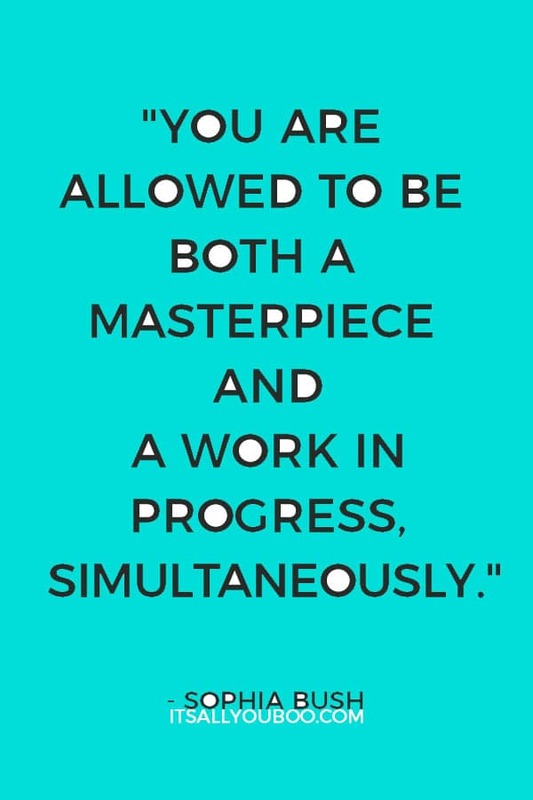 Taking time for yourself and doing what you truly enjoy. Thanks! This post has a great list of how to relieve stress! This is a really good list. Sometimes you just need a mental health day. I agree a massage can really help relax you. I also love taking long walks to help calm me down. It’s something about being in nature! Great list. HI Gloriao. Meditation also has helped me relieve stress so much. I’m glad you enjoyed the post. This article is such a good resource for coming up with different self-love ideas! 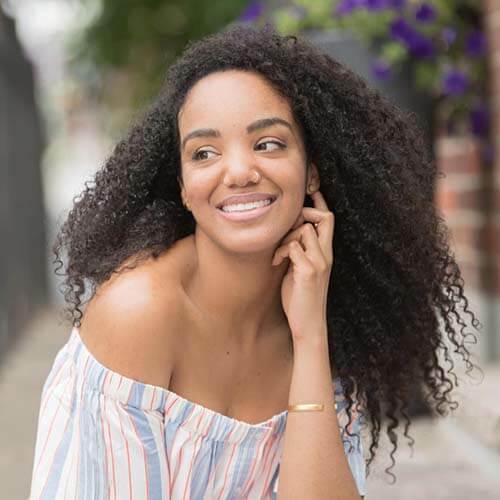 I tend to go toward nature walks and meditation and a face mask when I feel like I need me time, but I love the idea of actually signing up for a professional massage or acupuncture, two things I’ve considered but never done! I always love to go swimming when I am stressed out. But wow! Didn’t know that there are lots of ways to improve our mood. Thank you for sharing this. I’d love to try a salt bath in the future. Great suggestions! The older I get the more I important I think mental health days are. I love an epsom salt bath but on my next mental health day I’m planning a massage! You have some really great ideas! Mental health days are so important. Work can really get to you and time spent doing other things is an amazing help! Hi Nancy. Yes I agree that doing other things can help tremendously, especially when work starts to get stressful. I’ve been wanting to try a pottery class for quite some time now! I credit acupuncture tremendously with helping my stress and anxiety levels! It’s so relaxing, and I love how you get the time during the appointment to fall into a meditation. Hi Janelle. I love acupuncture as well. It’s been one of my most successful stress management techniques. I’m glad you enjoyed the post. SO many good options! I wish I had the time for all of them! I personally really like doing acupuncture. It’s really helped me a lot! Hi Madi. Yes, acupuncture is one of my favorite stress relievers! Hope you’re able to spend a mental health day soon. This list is so helpful. When I’m stressed and I need to relax I do some of the things you listed with others like dancing around the house with my dog or sing my favorite songs. Hi Nohora. I’m glad you found the list helpful and hope you’re able to relax the next time you get stressed. I love, love, love this! I love that taking a mental health day is a more commonplace thing now but I feel like there isn’t much direction from there on as to what to actually do with that time! And this list is SO perfect. My favorite currently would probably be journaling. I journal for a bit every morning and evening but I wonder what it could be like if I just dedicated an hour or so to journaling and really delved into my thoughts further. Thanks so much for putting all of these together! Hi Beatrice. You can never underestimate the power of stress relief while journaling. I’m glad you enjoyed the post.